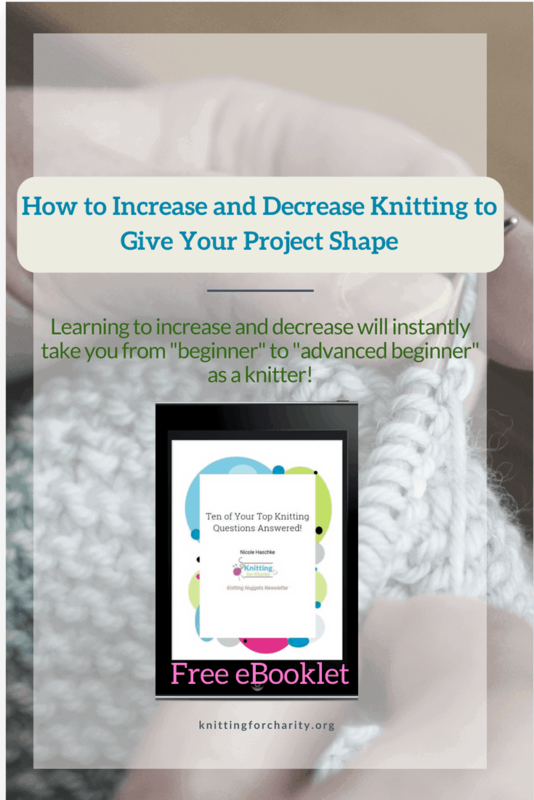 Learning to increase and decrease will instantly take you from “beginner” to “advanced beginner” as a knitter! Do you know how to do these knitting steps? If so, congratulations! You have mastered the basics of knitting. If these are the only things you know how to do in knitting, you can make quite a few projects. You can make scarves, dishcloths, washcloths, and even blankets! But if you want to knit things like hats, mittens, socks, and maybe even sweaters — anything that requires shaping — you’re going to need to know a little bit more. In short, you’re going to need to learn how to increase and decrease. What is Increasing and Decreasing? Increasing and decreasing refer to the stitch counts of a particular project. In other words, if you cast on and knit 40 stitches, an “increase” will take you from 40 stitches to however many stitches you “increase” by. And a “decrease” will do the opposite. You may have found, as a beginning knitter, that you’ve increased or decreased without meaning to. You may have mistaken a wayward slip of yarn on your needle as a stitch and knitted it, thus increasing your stitch count. There are three common ways to increase a stitch count. The method called for in a pattern generally depends on the way the designer wants the completed project to look. These three common ways are the yarnover (YO), the knit into the front and back of a stitch (KFB), and the make one (M1). 1. Yarnover. This is the easiest way to increase a stitch, but it’s usually used in lace projects. All you have to do is take your working yarn and wrap it around your right needle. Yes, that’s it! While the yarnover couldn’t be easier, you shouldn’t use it unless your pattern calls for it. Why? Because it leaves a hole in your knitting, and unless the pattern is designed for holes (ie., lace), you don’t want that in your project! 2. Knit into front and back of a stitch. This is usually called “knit front and back” for short, and abbreviated KFB. What you’re doing in this increase is knitting into a single stitch twice. This creates two stitches out of one. Literally all you do is this: knit a stitch as usual, but then don’t drop it off the left needle. Instead, you’ll place your right needle tip into the back of the stitch on the left needle and knit it. Only then will you drop the stitch off the left needle. This is a very easy increase, but be careful. The KFB appears in your knitting kind of like a purl and knit stitch next to one another. This might mess up the look of your project, depending on what the stitch pattern is supposed to look like. But if it’s in your pattern, use it fearlessly! The designer has already planned for the way it will appear. 3. Make one. This is the trickiest of the most common increases. But it’s by no means impossible! And, if you need a quick and easy coverup increase, this is going to be a lifesaver. One tricky part of this increase is that you’ll need to find the little bar of yarn between the stitch on your left needle and the stitch on your right needle. If your knitting is small and/or your stitches are tight, this might be a little tricky. Once you find it, you’ll slip it onto your left needle. Then you’ll knit it. Presto! Another tricky part is that if you don’t knit that little bar of yarn carefully, you could wind up with a small hole in your project. The trick here is to see how the yarn is lying on your needle. Knit it properly, and you’ll have no hole and a nearly invisible increase. The video below demonstrates all 3 methods! The three most common ways to decrease are knit (or purl) 2 together (K2tog/P2tog), slip slip knit (or purl) (SSK/SSP), and pass slipped stitch over (PSSO). Again, the way the designer wants the finished project to look determines the decrease they use. Decreases usually are either left-leaning or right-leaning. K2tog leans to the right. P2tog is usually worked on the wrong side of a project; when viewed from the right side, it looks identical to the K2tog. Meanwhile, SSK leans to the left. SSP, like P2tog, is usually worked on the wrong side. From the right side, SSP will look just like SSK. PSSO also is left-leaning, and in fact it looks very much like SSK. Here’s how to work these three decreases. 1. Knit/purl two together. This method is really quite simple. Insert your right needle into the next two stitches on your left needle (rather than just the next one). Then knit the two at the same time, as if it were one stitch. Voila: you’ve decreased one stitch. Purl two together works exactly the same way: Insert your right needle into the next two stitches on your left, and purl them at the same time. 2. Slip, slip, knit/purl. This method can be slightly trickier than K2tog. Slip two stitches from your left needle to your right needle. Then insert your left needle into the front of two stitches you just slipped. Then knit them together. SSP is the same, except that you’ll insert your left needle into the back of the two stitches you just slipped. Then you’ll purl them together. 3. Pass slipped stitch over. This is actually itself an abbreviation. The full name for this technique is “slip, knit, pass slipped stitch over knitted stitch.” Yeah, that’s a mouthful. That’s why I shorten it to “pass slipped stitch over”! The full name, of course, describes exactly what you’ll do. Slip a stitch from left needle to right needle. Knit the next stitch on the left needle. Then, with your left needle, grab that slipped stitch and stretch it up and over the knitted stitch. You can do this with purled stitches as well. Slip a stitch, purl the next, pass the slipped stitch over the purled stitch. The video below demonstrates all 3 techniques (with both knitted and purled variations). Now that you know how to increase and decrease, a whole new world of knitting projects can open up to you! 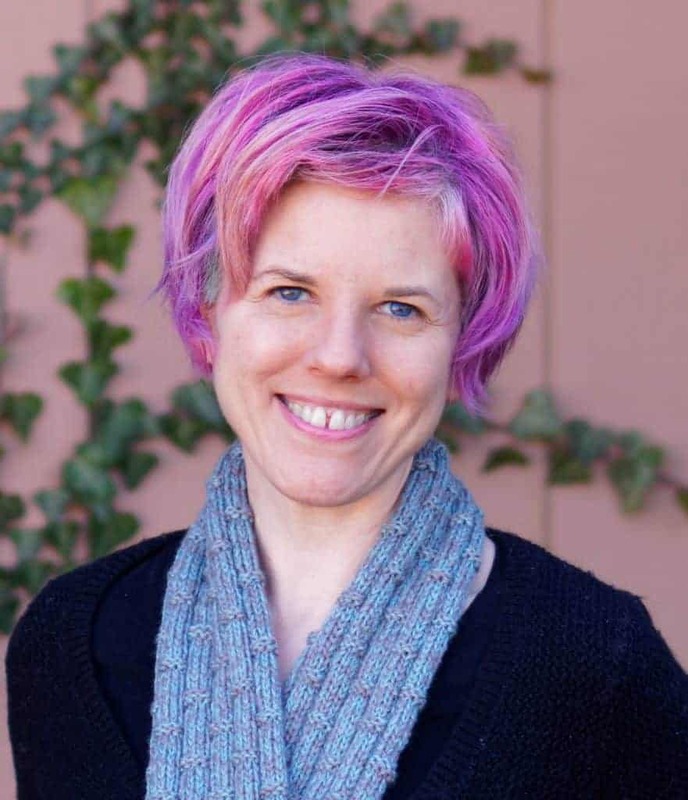 For more help with knitting techniques, peruse the library in this category!